Thanks for the invite. I am aware that my role, like that of Peter Jenner and Jamie Love, is to be a tomato-throwing target. I’m wearing red, so it’s not going to be problem for the laundry. Just one favour I’d like to ask from you: please watch out for my glasses. Legalizing file-sharing in exchange for a levy on broadband Internet access. A legal permission for online sharing of published copyright protected works, for personal non-commercial purposes, subject to a collectively managed levy. We need to discuss this model on two levels: 1.) In principle, and 2.) In practice. Fede Heinz recently asked on the A2K mailing-list: Isn’t the Sharing Licence a solution looking for a problem? I hope we can agree that this ‘war on sharing’ must be stopped. Because of the harm it does to all of us and to the free infrastructure of the Internet. Because good people like Jeremy, David, Eric and many others are wasting their lives, starting yet another campaign every time a new form of repression madness comes up, of futile, tunnel-vision, panic reaction by industry. At the recent Free Culture Research Conference in Berlin, Mike Linksvayer from Creative Commons raised a very good question. He was the respondent to a panel on which I had reported about a review of most of the academic literature on file-sharing. The results are contradictory and contested. If no harm can be proven, Mike asked, why should we pay a compensation? Can we legalize file-sharing without payment? The economists’ studies don’t prove that there is harm. Neither do they prove that there is no harm. We simply don’t know. Legal scholars from many countries, including the EU, US and Brazil have told me that a Sharing Permission is impossible without payment. Most importantly, I see the Sharing Licence as a welcome opportunity to reward authors. It is part of the new Social Contract on Culture, of the hybrid economy that includes individual market transactions, indirect market transactions via advertising, public culture funding, public broadcast fees, the prizes that Jamie just talked about and voluntary pre and post payments (kickstarter.com, flattr.com). 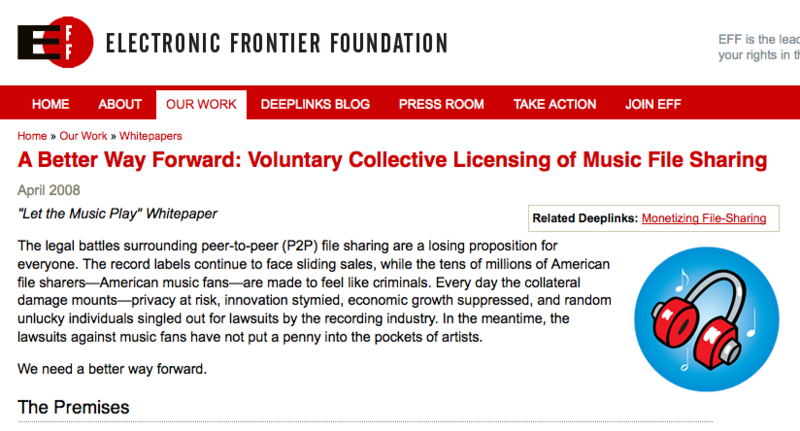 While payment is not my primary motivation, it is not just a grudging admission of a quid pro quo for legalizing file-sharing, but a welcome opportunity to get some intermediaries out of the way and turn this into a win-win situation for both audiences and artists. Collecting? How much? Distributing? To whom? Popularity? Measurement? Privacy! Social inclusion? Fraud? You will notice that „Privacy!“ has an exclamation mark. It is not a question but a design requirement, a sine qua non for the system. All of these issues can be solved. There are specialists among us, in protocols, anonymity, metadata, cryptography etc., so that we can sit down together over the next two days and build working solutions right here. A common mistake is jumping levels: Using a practical issues — we’ve just heard another example from Peter Sunde, claiming the Sharing Licence requires „total surveillance of the Internet“ which it doesn’t — to dismiss the principle desirability of the model. Where there is a will, there is a way. The decisive question is: Is there a will to stop the ‚war on sharing’? I tend to think of collective management as a practical issue. For example, when people ask how the levy is allocated across national boundaries: Collecting societies have a working solution in place. Is it the best possible solution? Probably not. But I realize, that collecting societies are different from the other practical issues I’ve mentioned — given the fierce criticism across the planet, and especially given the fight our host, Exgae La EX, is fighting here in Barcelona. I do think that we can come up with something significantly better than what we have today. I have prepared a draft proposal for a highly automated, transparent, efficient, democratic, authors-only, online collecting society under public oversight. It’s available for our discussion tomorrow. 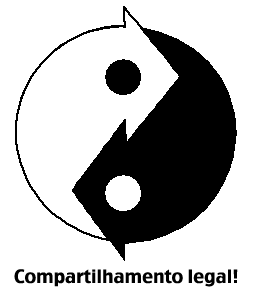 The second reason, I think this issue is different, is because something more fundamental is at stake: collectivity. This refers not only to collective rights management, but to other forms of collective action, to trade unions, public broadcasting, the state itself. In short, the fundamental question of what is to be private, what collective and what is to be public. So for my final point I would like to zoom out again to even more general principles. This is not about ‚Islam/Bin Laden vs. the USA,‘ as Huntington’s title suggests. It’s about European „Liberté, égalité, fraternité“ vs. the US-American version of it, where only „freedom“ remains — also the Stallmanian freedom to share and cooperate, but most of all the freedom of the market: the freedom of competition, the freedom of choice. Where Scandinavian, social-democratic ideas of equality and brotherhood, of solidarity and redistribution for a humane life for all and the betterment of the largest number, are frowned upon as communist. Where a president gets slapped by voters for setting up a social contract that ensures that fewer citizens go broke when they get ill. Where any attempt to establish a Max Weberian state monopoly on legitimate violence meets not only the expectable resistance of the weapons industry, but a popular uprising of people who think it the highest expression of their individual freedom to carry a gun into a bar. 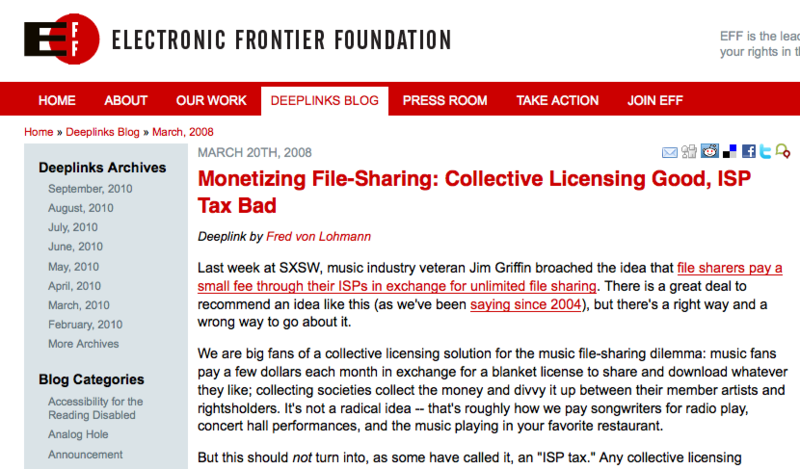 Our libertarian comrades in copyright arms, the EFF, have been active in attacking the mandatory Sharing Licence: It should not be — „as some have called it“ — a tax. Only our enemies have called the copyright levy a „tax.“ „Tax“ in any language (imposto, Steuer), including English, is unambivalently defined as money collected and spent by the state for the purposes of the state. If you don’t believe me, look it up on Wikipedia. Thus, these „some“ have persistently called it a tax, because they know it immediately makes the brain stop and triggers a knee-jerk reaction against more state and more money it takes from us. One month later the paper turned into a „Whitepaper“ and the EFF made it clear that before and above everything else, they don’t care about musicians, artists, audiences, not even the file-sharers they are defending in court. The fourth premise and the EFF’s highest principle is: No government! No government intervention into the workings of the invisible hand of the market that will lead us to paradise. After this excursus into what some have called the Californian Ideology, back to Europe. At the Free Culture Research Conference in Berlin, another very interesting question was raised: The majority of artists never earned a decent living. So did garbage collectors and nurses. Wouldn’t an unconditional basic income for all be a much better, more fundamental solution to a more fundamental problem? 1. 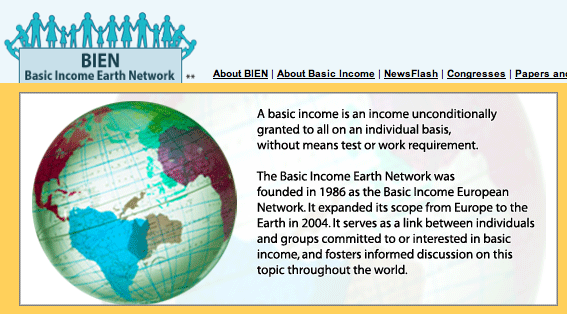 I do see a level of support for the basic income. Among economists. Sometimes even among business people, like German drug store millionaire Goetz Werner. But let’s face it, from a ‚real politics‘ perspective the basic income is not within reach right now. The Sharing Licence is. It was in law-making in France, Italy and Belgium. It was pretty close on the Isle of Man, and, as Peter just told me, there is a chance that it still might happen there. And it is realistically possible now in Brazil. It is ‚only‘ for authors and artists, it’s not unconditional, but it will help a significant number of artists who find an audience for their creations to go full-time. It will allow a much larger number of creators to derive a part of their livelihood from their creative work and thus improve cultural diversity for all of us. It’s a start. I’ve been accused of being a social-democrat reformist. But that’s not it. It’s simply that I’m not young enough anymore to be satisfied with being right. I want to see results. In my life-time. And this is the second ‚but‘: The basic income doesn’t do this. If you share our idea that the war on sharing is a severe problem that urgently needs a solution, then please help us do it. Thank you for your attention — and for no tomatoes.